Reviews of the novel on which the movie True Believers is based. The ordinary confines of living leave Sax feeling distant from the world around him. So he takes up his saxophone and happens upon a pavement artist. Sax accompanies Zoe's artist endeavors by playing his saxophone for which they agree to split the hat, allowing "the notes of my instrument to flow out over her colors, and mingle with the feet of the passers by." Such a poetic beginning results in a profound yet gentle love story. When he picks his daughter Sarah up from school, Sax suggests a new game where "we don't do anything that we normally do." So Sax and Sarah build sandcastles upon the beach, which leads to an invitation to go to Auckland to a festival to create sand sculpture. Firefly, Sarah's angle, accompanies them everywhere. The event organizer Adam looses his job despite the success of the festival. He becomes Zoe and Sax's manager when they and Sarah are invited to build another sandcastle in New Zealand. Conflict develops as Zoe and Sax grow closer together, and as politics influence their creative efforts. Australian novelist Author Alan Clay breaks the mold of traditional romance to make it an art of creation in BELIEVERS IN LOVE. The light tone of the narrative belies the profound observations of life, art and love. Delightful anecdotes interspersed amid the narrative voices keep the pace moving even as the shifting point of views that become a voyage of discovery. BELIEVERS IN LOVE is a powerfully creative work with prose that sings like poetry, in addition to philosophical observations that may be picked up like shells upon the seashore. Beautifully told and evocatively rendered, BELIEVERS IN LOVE comes very highly recommended. "Believers in Love, the third offering by quirky Australian novelist, Alan Clay, is about love, laughter and life. The story is liberally interspersed by anecdotes taking an alternate look at life, sometimes from the point of view of the books characters, other times from beyond, but always with a depth which gives pause to the reader before the story continues. Sax is exhausted, from lack of sleep, and from hiding from the vast whirl of experience. Then in one day he meets Zoe and takes his daughter Sarah to Bondi beach to build a sandcastle. Both events change his future. Sax and Sarah are discovered on Bondi beach and whisked off to build a sandcastle for a festival in New Zealand. This adventure seems set to launch them on other, equally as exciting adventures, along with Zoe and Adam, the festival organiser. Not all adventures are exciting, however, as Sarah finds out. Her Dad and Zoe are getting closer, and her fairy, Firefly, isnt always there when shes needed. For Sax and Zoe theres the confusion of their feelings for each other, and the discovery that not every project goes as planned. For Adam, the knowledge that politics is not always fair lands him in Australia with the others. This is not just a story; this is an exploration of emotion and philosophy." "From time to time I review books that are not fanatsy or SF genre and this time I have a gentle and enlightening story by Alan Clay. This simple story of discovery, wanders through the reality of making dreams true and exploring the world around us through art. 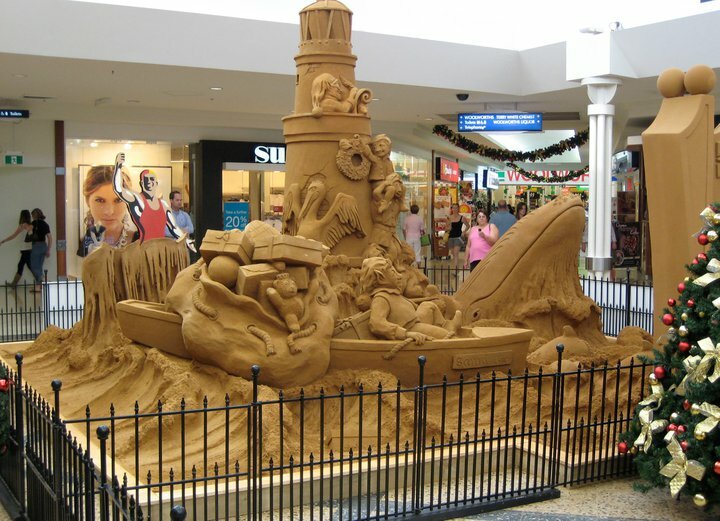 The story follows the crazy adventures of a team of sand sculptors from Bondi to NZ. Interesting and entertaining. Alan writes with a clean clarity that allows the reader to contemplate what they are reading as the story unfolds. Nice little book, one the family would enjoy." Nothing could be more deceiving than the simple cover of this most unusual novel, sun shining on sand and water with two palm trees and a title overlaying all. That is, until one finishes this living meditation with its yoga focus in actual practice. Sax and his daughter, Sarah, make sand sculptures and live in the "now" moment. They trust that they will be where they should be and do what needs to be done in that peaceful, serene Buddhist atmosphere. Not exactly placid folks, Sax and Sarah begin to play a game, to do the opposite of everything they normally do and see what magic happens. Off they whirl to their first festival job where they will construct their castles and mesmerizing sand figures to the delight of all and the consternation of a few city council members and Sarah's teacher, who wasn't informed of this absence until after the fact. Harmony prevails over the conflicts they encounter and this begins to look like a future career and way of being. Sax meets Zoe, a painter who is privileged to have her first gallery exhibition, but who nervously leaves that show for the one Sax and Sarah are doing, again with sand sculptors and adding Zoe's chalk colors to the ensemble. Sarah's harmony is now wavering between acceptance and disturbed rejection, while Sax and Zoe meld into oneness. Verbal battles join the fray! Interwoven in this flowing tale are brief excerpts of stories that one would call wisdom or, more exactly, koans, for the reader's reflection, and perhaps even meditation. These are placed so perfectly that each saves the story from being just another post-60s and 70s hippie story. Add the phenomena of a manager who gets fired over the first festival agreement and the reader realizes that things might remain the same but also might yield a different wavelength current into the present state of nirvana. A magical creature, Firefly, is sacrificed for a worthier creature and cause by a maturing young girl. An urge to combat and another to vengeance take a different and unexpected road. Light and yet profound, this novel is a most unusual find which all will enjoy and savor, long after the last page is turned. Art and living may be treasured repeatedly, but must yield to the next magical moment! Believers in Love has been released for the Kobo reader and it can be purchased in New Zealand through Whitcoulls or in Australia through Borders. It can also be purchased for the Apple iPad through the iBooks app at iTunes. The book has also been released for Amazon's Kindle Reader. This means it is available to be read on all mobile devices including the Blackberry, iPhone and Android phones, as well as for the iPad, Mac and PCs. Buy the Kindle edition for US$0.99 from Amazon. Order this novel in paperback from bookshops or online stores like www.amazon.com, where you can also read part of the book through the 'Search Inside" function. On this site you can find information on the auditions for the roles in this movie and an overview of True Believers. On this site you can also check out the production credits and production photos for Butterfly Crush, find more information on the cast, the development process and the production, find an outline of the story plus stills, and view podcasts.